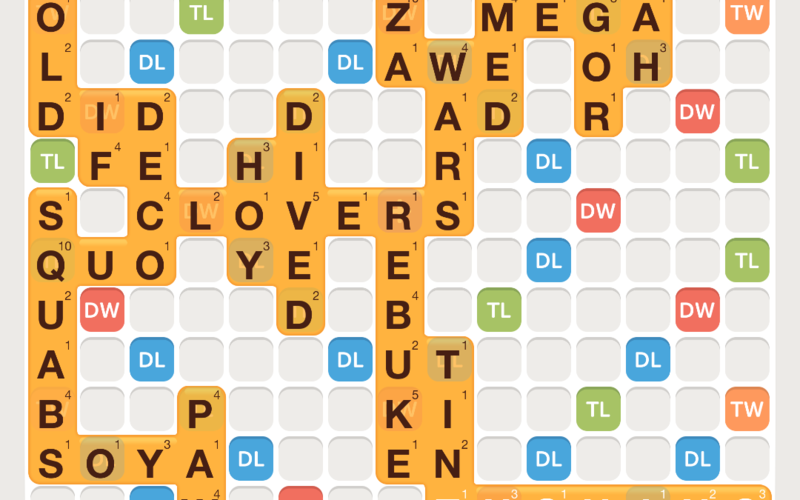 My beloved and I play Words with Friends – an online game that vaguely resembles Scrabble. Words with Friends is way looser and allows you to play words like “ut” or “thouing” – words that many dictionaries don’t recognize and certainly that you never use in casual conversation. (Google spelling currently has them highlighted as unacceptable words though I did check to see that thouing is in the Oxford.) You put your letters on the board and the app tells you whether it is an acceptable word. Some clever word knowledge is useful but it’s really about arranging the letters until a word is deemed acceptable. My honey has played way more than I have but we are still pretty evenly matched – in fact, for our most recent games, I have 5 wins to his 2. However! It turns out that Words with Friends is also Words with Privilege in that there is a perfect lesson in privilege built into the game. In normal Scrabble and in what I thought was normal WWF, if you swap tiles, you lose a turn. Everyone knows that. If your tiles are awful, sometimes it’s worth it to selectively dump and pick new ones in the hopes that the risk will pay off. Sometimes it does, sometimes it doesn’t. But it’s an option equally available to both players with equally distributed consequences – that of losing a turn. Turns out, WWF has a different set up. “Just play the first thing you see!” I said impatiently. “OK, OK!” he replied. “Got it!” he declares triumphantly. Let me interject here that you don’t get the same extra 50 points for playing all 7 letters that you do in Scrabble so it’s not as big a deal point-wise though you do get all the accumulated points from your letters, multiplied by 3 if it’s triple word. He had racked up 60 points. “How did you swing that? I asked. We looked at our screens and compared our coins – I had 10 and he had 689! “Where did you get those?” I demanded to know. I started to tease him and hurl insults among which were accusations of male privilege and then I stopped to really think about the privilege part. Thus this post. I imagine he earned his coins by playing for way longer than I have but he actually has no idea where they came from. These coins provide him with a significant advantage which there is no way for me to overcome. No matter how hard I work, I will not be able to swap my crappy tiles without consequence while he can swap tiles every turn to try to increase his word score. Privilege in action. Granted, he had earned his coins by being slightly addicted to the game and playing way more than he should, so it’s not a totally unearned advantage, but it is a perfect representation of how privilege manifests and is justified. So yeah, privilege. “You mean you can’t just swap your tiles?” he asked innocently. “No, I can’t just swap my tiles!” I retorted furiously. Privilege is often not seen by those who have it. It is taken for granted, with a player often just assuming that someone who is not winning at Words with Friends just isn’t as good a player, or has been unlucky with their tiles, or just doesn’t care as much. People entering the game for the first time have little hope of accruing enough tiles to provide the proverbial level playing field. They also get fewer rewards for their wins. Sound familiar? But because it’s not and because aspects of privilege permeate our society, the next time you assume that someone is just not as good a player as you, check your privilege!